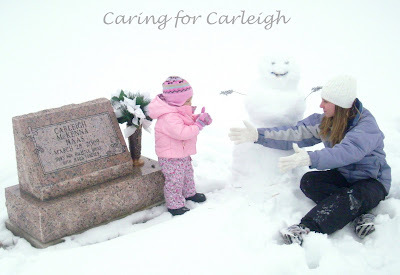 It's been 11 months now since Carleigh's birth. There's really not much to say. Anthony and I are doing well. We've pretty much found our normal again (or as normal as it can be). 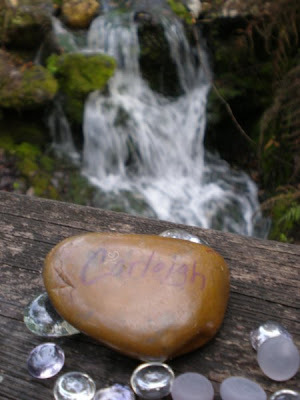 We don't talk of Carleigh as much as we used to but she's still very much in our thoughts and hearts. I still look at her pictures and listen to her playlist a lot. It seems like it was so long ago when we had those moments with her. 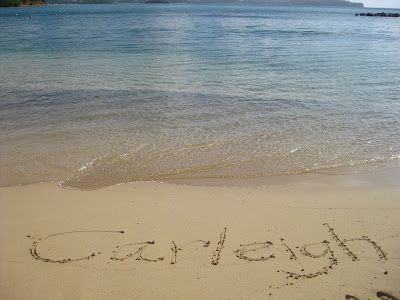 We (I) are busy right now planning for Carleigh's first birthday and then the March for Babies walk. There's a lot to do! Plus, I am becoming more involved in Sufficient Grace Ministries, which is really great! 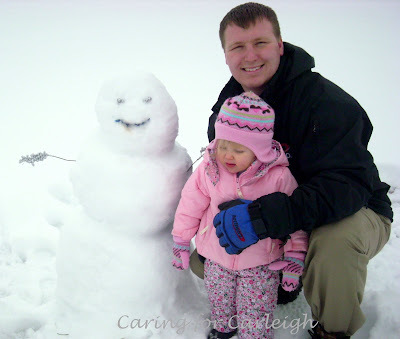 I haven't been blogging here as much or visiting other babylost blogs as much as I used to. 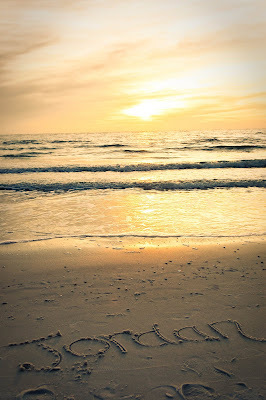 I am at the point in my grief journey now where I just don't need it as much as I used to. I spent a lot of time on the computer with blogs and away from my family for many months and I am now ready for that to change. They are more important to me than anything on here. There are still things that I want to share on here for my own remembrance that I will get to eventually. Also, I won't be leaving completely. I just won't be around as much as I used to. On February 11th last year Anthony and I got a 3D/4D Ultrasound done so that we could see our daughter together. It was such a wonderful experience. I do remember smiling the entire time because it was so amazing to see her on the screen moving and sucking on her fist. One of the first things I noticed about her was her chubby cheeks. Just like her sister! I haven't posted these until now because it was only recently that I converted the file type so that I could upload it (had to separate into two different videos too). It was amazing for me to watch it because it was her alive. To see the little hands and feet I held move. To see the lips that I kissed open and close. This is the closest I got to meeting her alive face to face. It's so moving to me and I just wanted to share. This is the little girl I love so deeply. 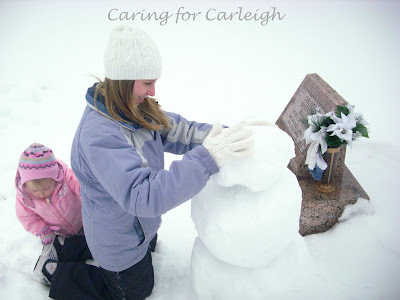 With all the recent snow that has accumulated in our area, I knew it was the perfect opportunity to build a snowman at the cemetery. I have been wanting to do it all winter but all previous snow came and went so fast that I didn't have the time to get it done. 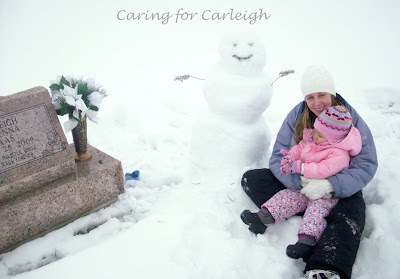 The snowman that we built at the cemetery today was both Kyndra's and Carleigh's first. I made sure we had all our stuff in our van so that we could head out there after church. 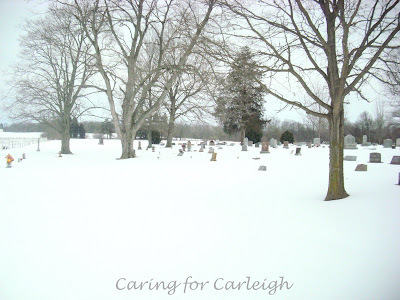 When we arrived at the cemetery the gates were closed and the paths were not plowed. I was disappointed. I told Anthony we might be able to just park and walk in so I got out and made sure that I could move the gate to get in. It took a little effort as I had to remove a little bit of snow but I was able to open the gate enough so that we could get in. I figured it was ok since the gate was not latched but a tiny bit open anyways. 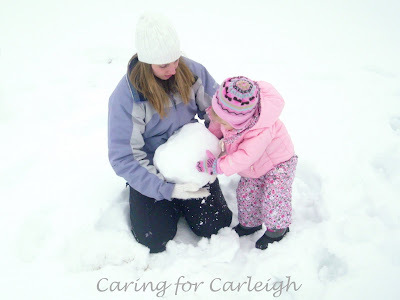 I also made sure that the snow was good for packing and to my delight it was very good packing snow! 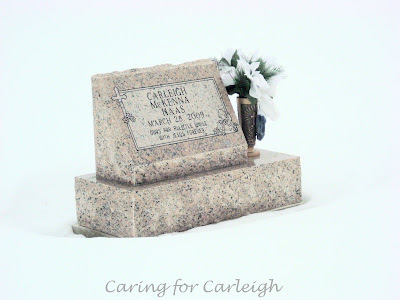 So we trudged through the snow in the cemetery to get back to where Carleigh is. Anthony made the bottom 2 parts of the snowman while Kyndra and I watched and played a little in the snow. Then Kyndra and I worked on the snowman's head. I put it on and we all helped to smooth out the snowman and put snow in places that needed it. Then we had to figure out what we were going to use for a face and arms. 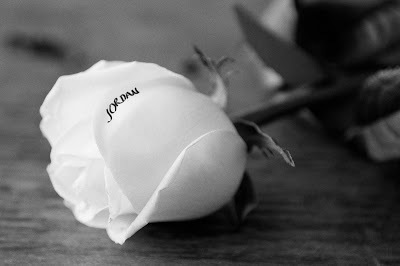 Anthony pulled out some of the decorations in Carleigh's vase and voila! The whole time we were there the horses watched us by the fence, which is not too far from her grave. 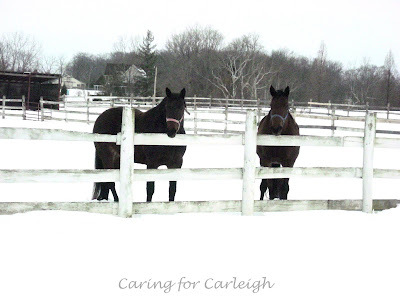 These are the same horses that were present and watching while we were at the cemetery the day of Carleigh's service and burial-kind of like they were paying their respects. I've always liked those horses and it makes me feel good to see them while we're there. Wish I would've had a carrot or something. Right before we left I made a snow angel beside her grave just for the fun of it. Happy Valentine's Day everyone!! I hope you all spent some quality time with your sweeties. I've been away from blogland for several days and it's been a nice break. I'm actually finding it pretty difficult to keep up right now as I am more tired because of rainbow baby. Usually I catch up a little when Kyndra naps in the afternoon but I have been napping when she naps so needless to say I have fallen way behind on everyone's blogs. I'm sure you all understand! 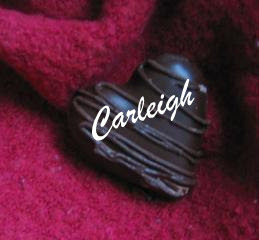 This cute candy heart was created by Shannon. This lovely piece of chocolate was created by Jennifer. 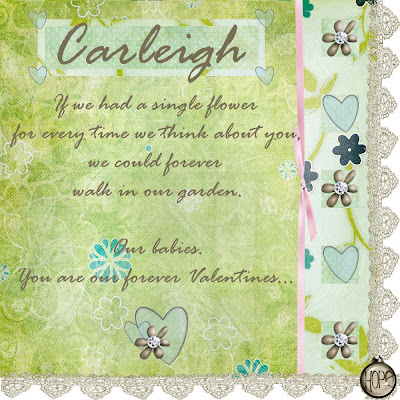 This beautiful card was created by Birni. 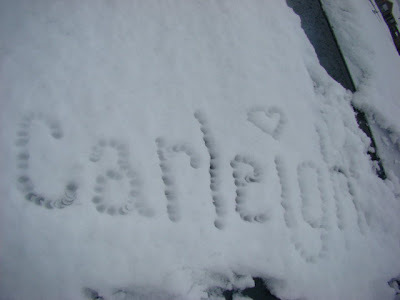 Heather wrote Carleigh's name in the snow. 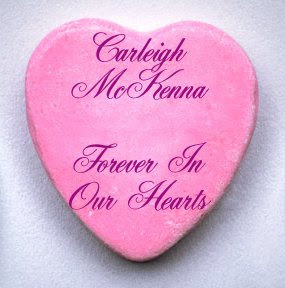 I don't know why I decided to but I was checking out Shutterfly one day and I saw that they were having a little sale on their photobooks and I thought it would be neat to create one for our parents so that they always have a little book of pictures of Carleigh to help them remember. So, I spent hours creating these books. I purchased them and had them shipped to their houses as a surprise gift. I sent a little note with each saying it was an early Mother's and Father's day gift for them. Most of each book is the same but there are some personalized pictures in each. And I even made up a little poem that is on one of the pages of the books. They both got the books pretty quickly and were happy to get them and quite surprised too! When we returned for a visit I was able to see my parent's book and it turned out really well. I know I would love to put all her pictures in a photobook but that would prolly be a pretty expensive endeavor! I have her scrapbooks anyways and you can't really beat something made with love by a mommy's hands. The first book is my parent's and the second book is Anthony's parent's. I'm finally getting around to posting the photos that people have sent me. I'm so behind! Thank you to everyone! 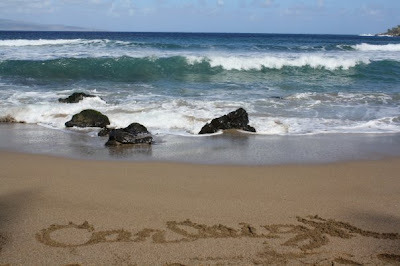 This picture is from Sue from St. Lucia. She actually took quite a lot but I decided to just post one of them here. The above 2 are from my cousin Kate when she visited Seaside, OR. 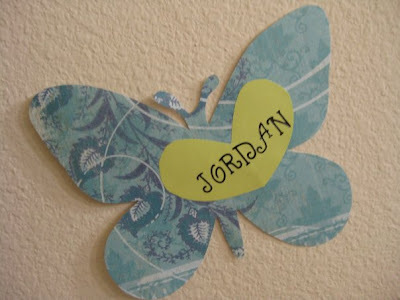 Franchesca created this hope collage for Jordan. Rikki took these photos in Australia. These flowers were done by Sarah and Richard at Say It With Flowers. 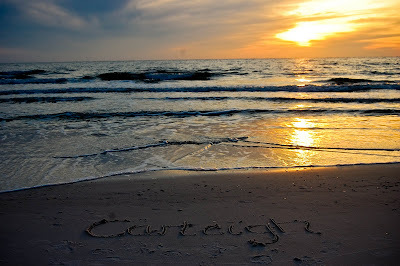 These pictures was taken by Emily at Laguna Beach in Panama City Beach, FL. 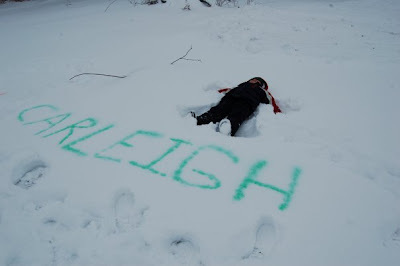 Megan wrote both Carleigh's and Jordan's names in the snow. 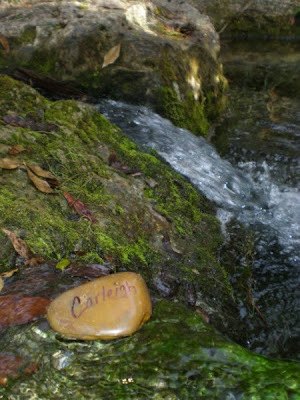 Lisa created some photos near a waterfall. 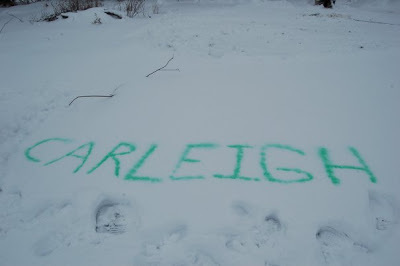 Betty got creative and wrote Carleigh's name in the snow and colored it! Her son, Luke, even made a snow angel. 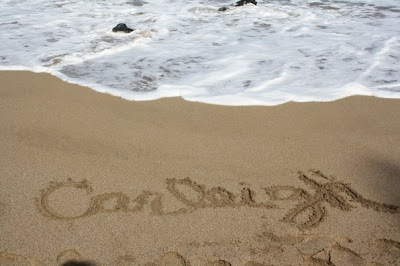 Heather wrote Carleigh's name in the sand in the Hawaii when she vacationed there. I apologize if I forgot anybody. You can view all the pictures (as I only included a few for some) in the name gallery. Thank you everyone for sending me these! They are always so welcome and I love them! Things have been going pretty good lately. Life has been as busy as always plus I've been tired lately, which could be a combination of me staying up later than I should and my pregnancy. I was able to get in a good nap yesterday but today I didn't as I kept getting phone calls from my hubby (thanks a lot!). I want to let everyone know that I will not be sharing pregnancy updates on this blog unless it applies to my journey with Carleigh. 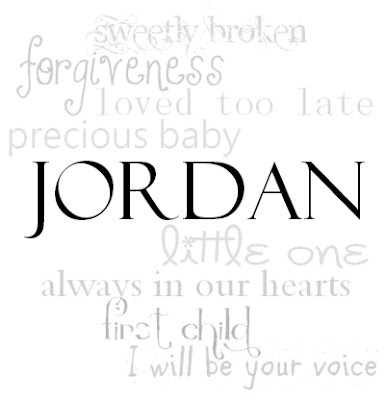 All updates will be on my family blog, so if you wanna check up on me you should check there. You know, unless this baby receives a fatal diagnosis too, but I'm not anticipating that. 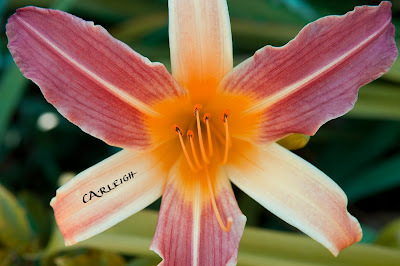 I finally made it to the cemetery to visit Carleigh on Monday. It's been several weeks since my last visit. The weather was pretty decent that day so I thought I would take advantage. I only stayed for a few minutes but it was nice. Pretty soon I will have to think about what spring arrangement to put in her vase. In addition to her birthday celebration I plan on holding some giveaways and I'm excited for this. I've already got a few set in stone (thank you to those who have been generous!!!!) and I'd like to do a few more. I've got some ideas for some more but I'm still deciding. The other thing that I am planning is our family team for the March for Babies. This year we are going to do the walk in Findlay since the one in my area was combined with a larger one because of economic reasons. So, there really should be no excuse why we shouldn't have a nice sized team this year. People don't have the excuse of driving several hours down now since we will be local. (Thank you to everyone who was on our team last year for supporting us!) And really, I don't think that's a good excuse anyway since Anthony and I have been making the trip for 4 1/2 years. No doubt if the tables were turned we would be there for support. I just hope people want to do the same for us.